O God, who have given us in Saint Frances of Rome a singular model of both married and monastic life, grant us perseverance in your service, that in every circumstance of life we may see and follow you. Through our Lord Jesus Christ, your Son, who lives and reigns with you in the unity of the Holy Spirit, one God, for ever and ever. "I give you a new commandment: Love one another as I have loved you, says the Lord (Jn 13:34)." In the fifteenth century St. Frances, among the noble ladies of Rome, showed herself an example of what a Christian wife should be. After the death of her husband she retired from the world and lived in a monastery of Oblates that she had founded under the Rule of St. Benedict. God favored her with the visible presence of her guardian angel with whom she conversed familiarly. Historically today is the feast of St. Dominic Savio was an Italian adolescent student of Saint John Bosco. He was studying to be a priest when he became ill and died at the age of 14, possibly from pleurisy. St. Frances of Rome (1384-1440) founded the institute known as the "Oblati di Tor de Specchi" in the Holy City. She was a wealthy patrician and after her husband died, she gave up all her wealth to live a life of abject poverty. Her special privilege from heaven was familiar conversation with her guardian angel. Reading the life of St. Frances, one gains the impression that she moved and lived in the spiritual world more than on earth; in fact, that which gives her life its unique character is her intimate relationship with the blessed world of holy spirits. During the three periods of her life, three angels of different rank accompanied her, ready to protect her soul against any onslaught of hell and to lead her step by step to spiritual perfection. Day and night the saint saw her angel busy at a mysterious task. With three little golden spindles he unceasingly spun golden threads, strung them around his neck, and diligently wound them into balls. A half year before her death he changed his work. Instead of spinning more golden thread, he began to weave three carpets of varying size with the golden thread he had spun. These carpets symbolized her lifework as virgin, mother, and religious. 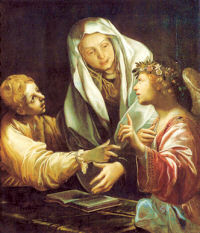 Shortly before her death, she noticed how the angel was hurrying his work, and his face was unusually fresh and happy. At the very moment when the last carpet had reached its required length, her soul departed into eternal bliss. Patron: automobile drivers, automobilists, cab or taxi drivers, death of children, lay people, motorists, people ridiculed for their piety, Roman housewives, widows. Symbols: often depicted as a woman habited in black with a white veil, accompanied by her guardian angel, and sometimes carrying a basket of food; Nun with her guardian angel dressed as a deacon. Monstrance and arrow; book; angel with a branch of oranges; receiving the veil from the Christ Child in the arms of the Blessed Virgin. Today's Gospel is often used by Protestants to challenge the Catholic practice of calling our priests "Father." Learn how to defend this practice — begin by reading Art Kelly's apologetics article, Call No Man Father?. Discuss this custom and the reasoning behind it with your children. Invoke St. Frances' protection as you are getting in your car to drive somewhere today. St. Frances was certain that she had a vocation to the religious life from the age of eleven. However, her father forced her to marry, and so she instead joyfully loved and served her husband until his death enabled her to enter the religious life when she was fifty-two years old. Even when you may have certainty that God is calling you to walk a certain path, His timing may be different from your own. Reflect on your own vocation: regardless of any doubts you may have, or seemingly unfulfilled desires to do more for God, abandon yourself to His will of the present moment, and joyfully focus on fulfilling the small duties which your vocation asks of you. Read about sanctification through the present moment in Rev. Jean-Pierre de Caussade's excellent little work, Abandonment to Divine Providence (online version). Here was a boy-saint who died at the age of fifteen, was one of the great hopes of St. John Bosco for the future of his congregation, and was canonized in 1954. He was one of ten children of Carlo and Birgitta Savio. Carlo was a blacksmith and Birgitta was a seamstress. When Don Bosco was looking for young men to train as priests for his Salesian Order, his parish priest suggested Dominic Savio. Dominic became more than a credit to Don Bosco's school—he single-handedly organized those who were to be the nucleus of Don Bosco's order. Patron: Boys; children's choirs; choir boys; choirs; falsely accused people; juvenile delinquents; Pueri Cantors. Learn more about the Salesians and Salesian saints.